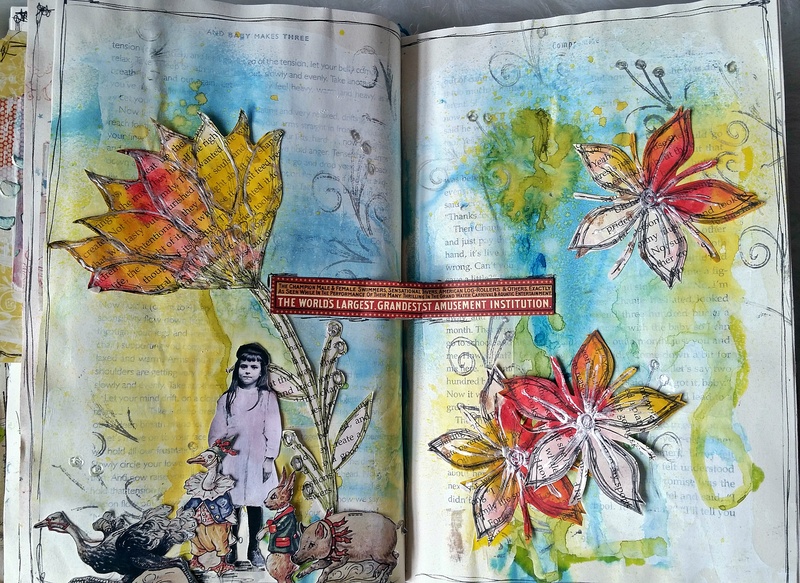 Here is the last of my layouts for my altered book. You can see Part 1 HERE. I know I said this before but I really enjoyed this project. 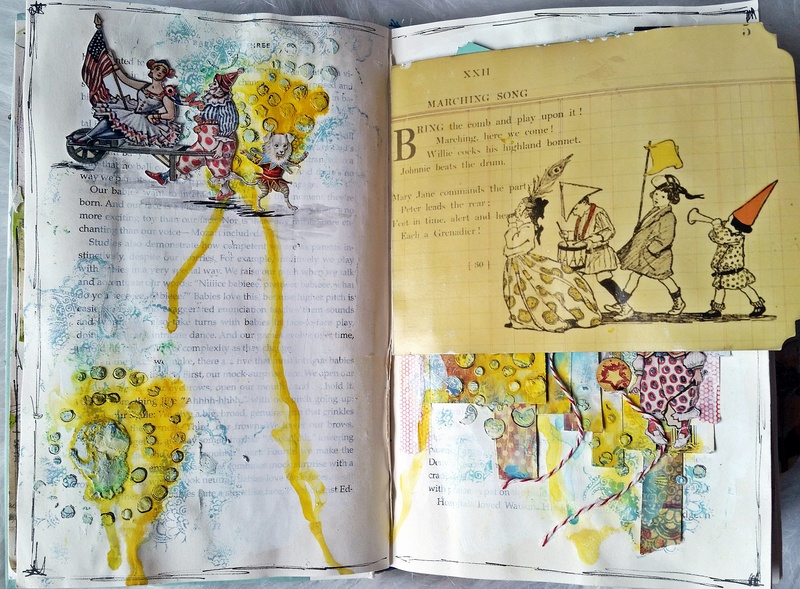 I hope you are inspired to save those old books destined for the trash and start creating something fun! 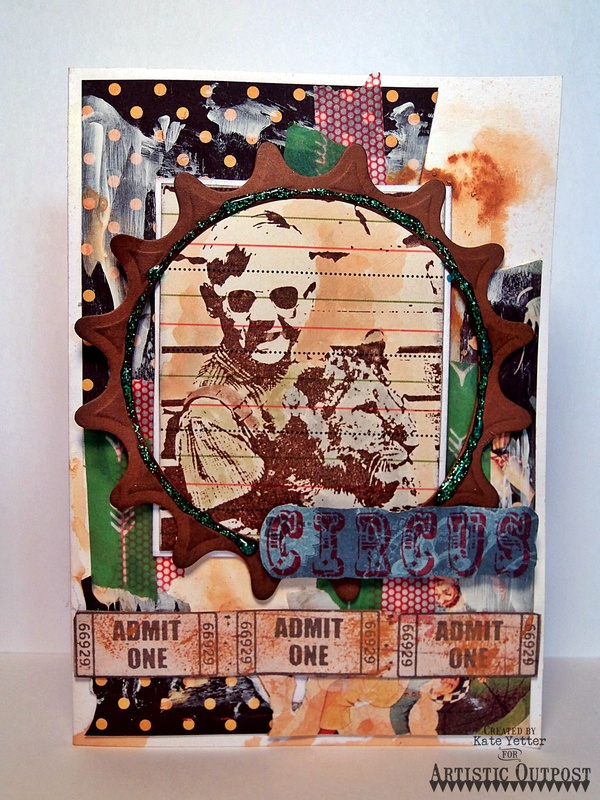 I have always loved the circus and of course anything vintage so this was a very fun project for me. It was a great place to explore background texture and bright colors. 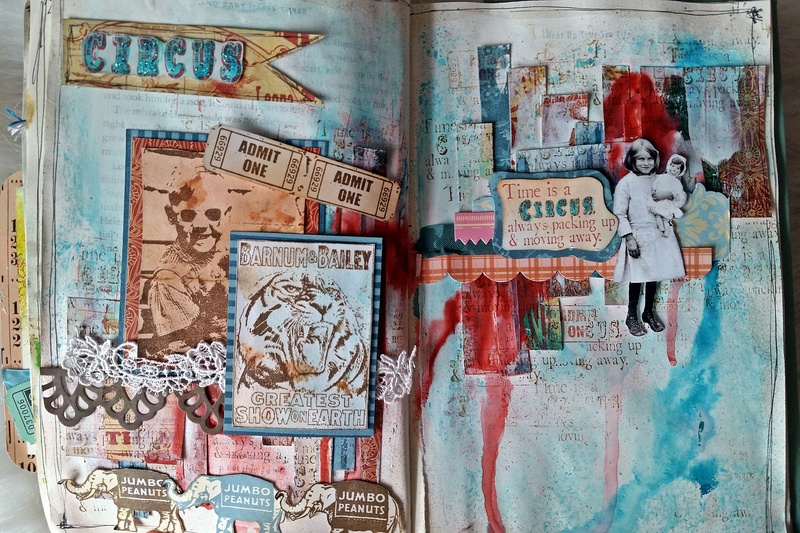 It all started with a circus kit that I won, full of lovely papers, stickers and images. 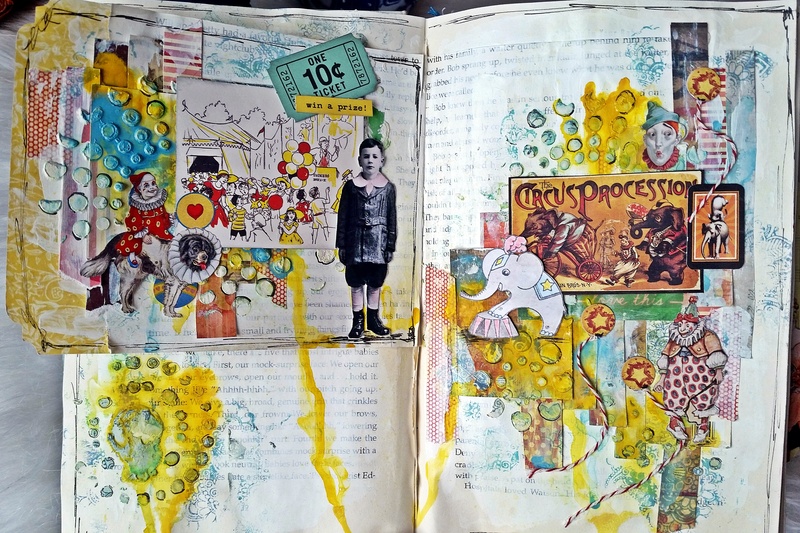 From there I decided to make an altered book around the theme. I still have more pages to show so be looking for Part 2. 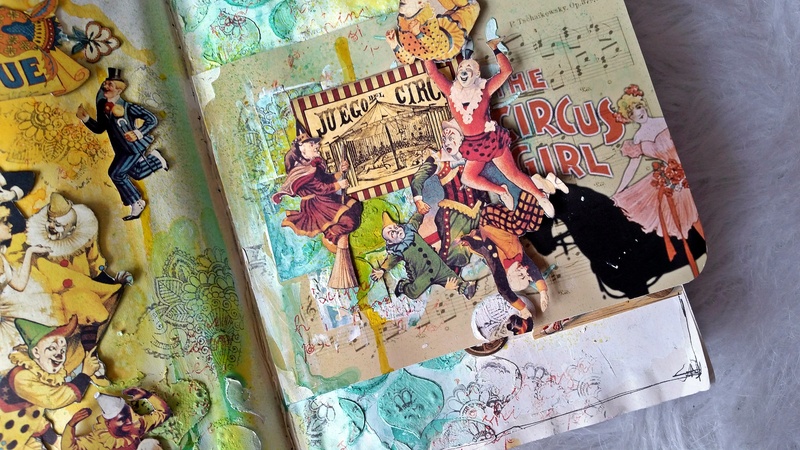 I just loved the idea of doing a Altered book centered around the Vintage Circus Theme. 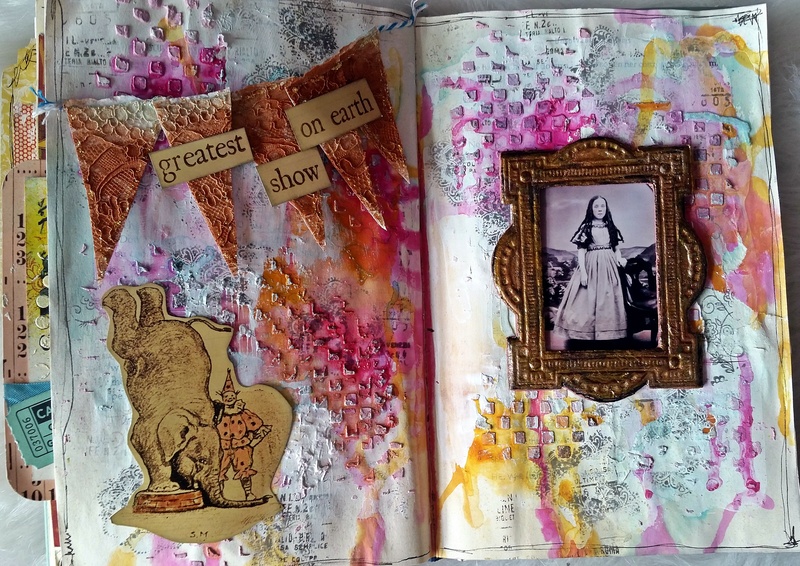 My very first layout in the book was this one, created for PaperArtsy, using Lynne Perrella stamps. 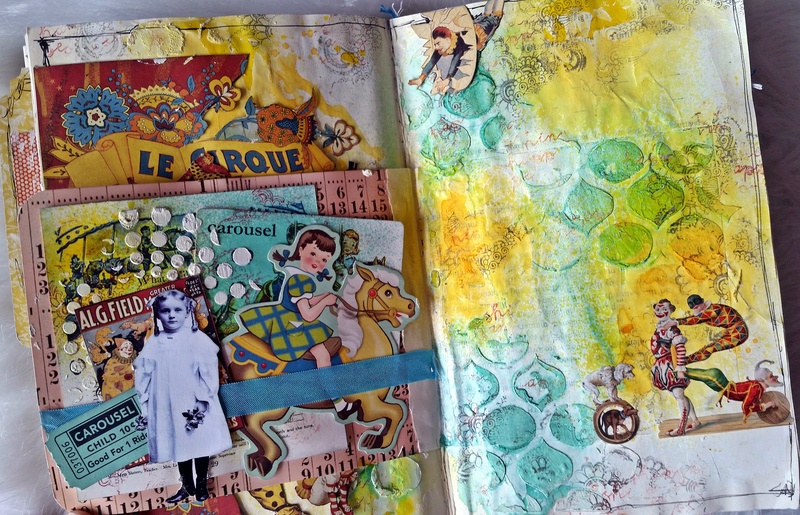 Her images have the perfect amount of vintage and quirky to fit with this theme. Have you ever seen the circus scene in the Phantom of the Opera movie? It is all color, sparkle, and mystery. Everything I envisioned the vintage circus to be. 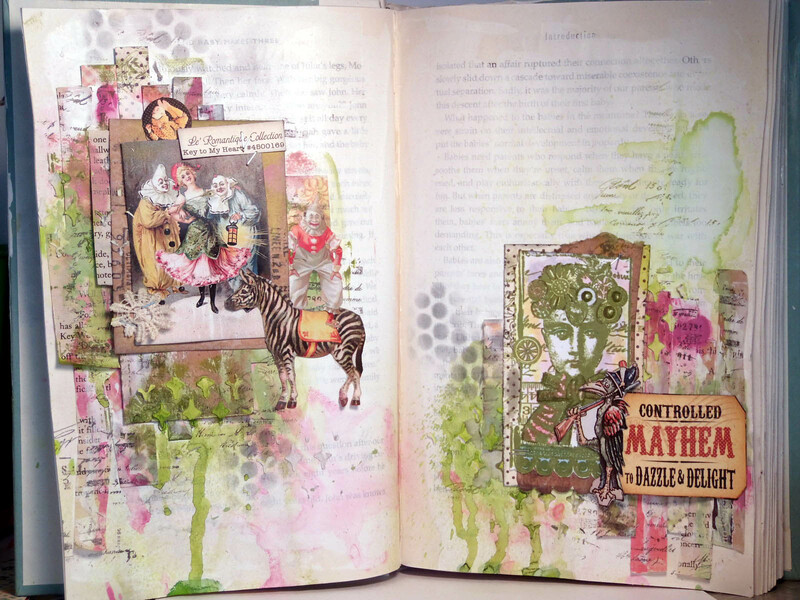 I had so much fun creating this altered book that I sent it in for publication and was published in the 2016 Summer Issue of Art Journaling by Stampington and Co.
My step by step tutorial for the creation of this layout can be found here. 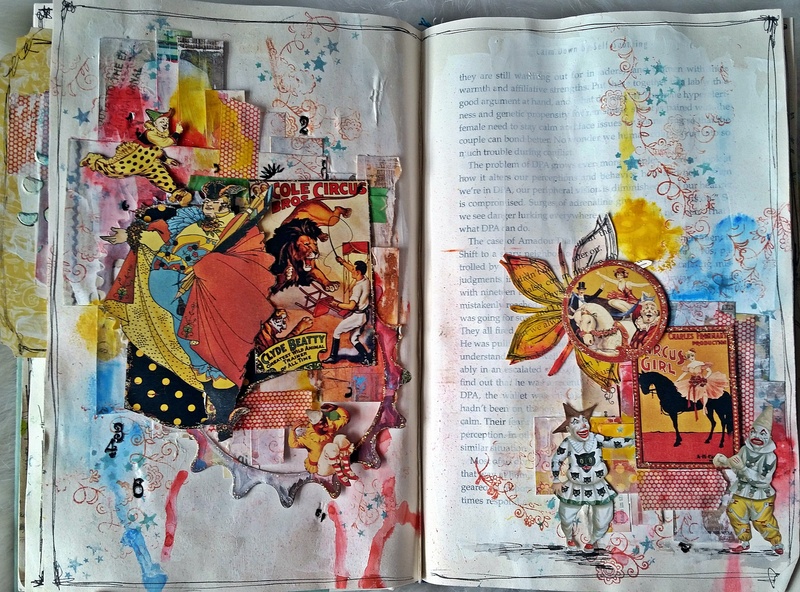 I will be sharing the rest of this altered book in future posts so be looking for that if you enjoyed this post. I enjoyed all of your feedback from the recent poll that I posted. In case you didn’t notice, I have started to implement those ideas into my weekly blog schedule. I am having fun writing about other topics that interest me. Someone asked why I didn’t include mixed media and scrapbooking on my poll. To answer that, I will continue to include those types of projects as that was the initial inspiration for starting my blog. I forgot how much I missed blogging. Football season is the perfect excuse to hop on the computer while hubby is busy. I don’t much prefer football so I find it the best time for crafting or catching up on other things. This week I am focusing on making personal lists. Since I am all about lists I am working on creating a bunch of ‘TO DO’ lists for my art goals. I love the new year because it gives me the chance to start over on all those uncompleted projects. Of course that means I am a year older this time around but that can’t be helped. So, on to the project. 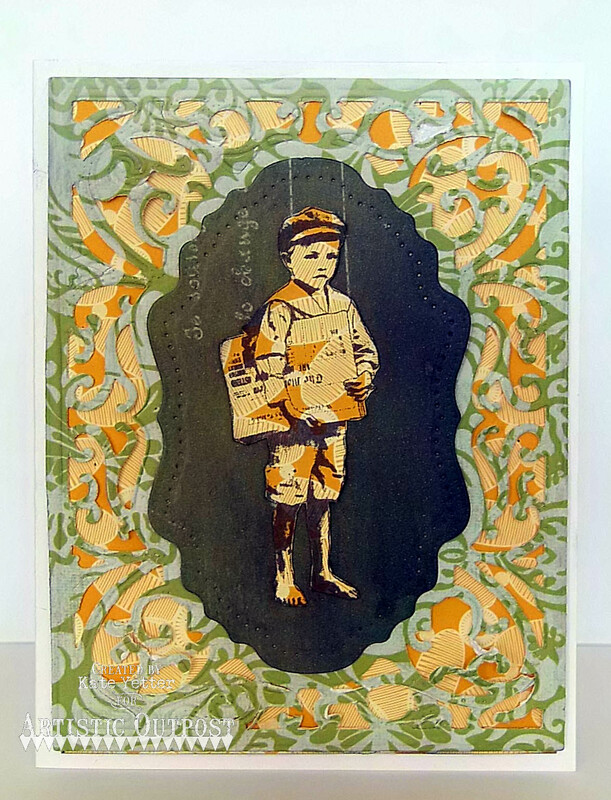 Lynne Perrella is one of my favorite stamp artists. She never disappoints when it comes to her new releases over at PA. 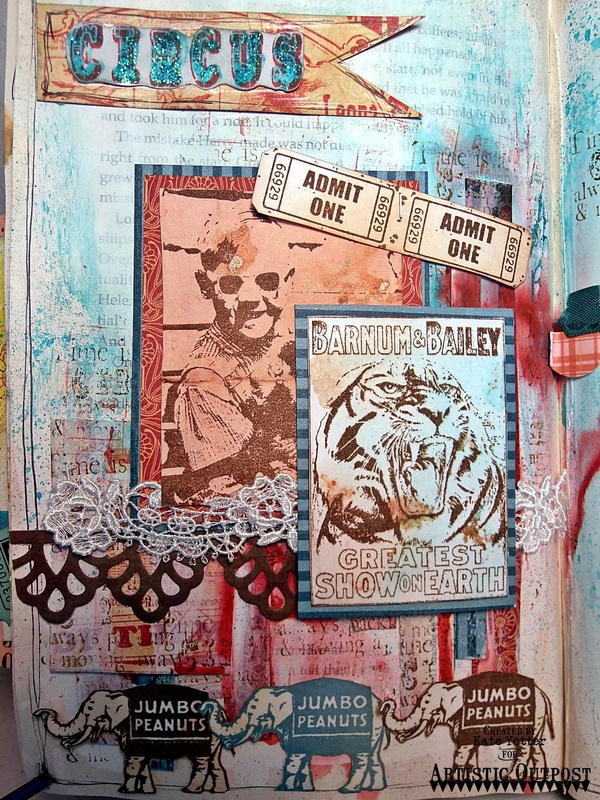 I made this tag for PaperArtsy using a beautiful Lynne Perrella stamp and a few other goodies from PA. I have a step by step Tutorial over on the PA blog. If you didn’t answer my topic poll. I would love to hear your opinion. It is in my last post. Take a sec to fill it out so I can start implementing a few more interesting topics into my posts. Welcome! I can’t believe it is already the second week of December. I guess that means I should share a Christmas project. 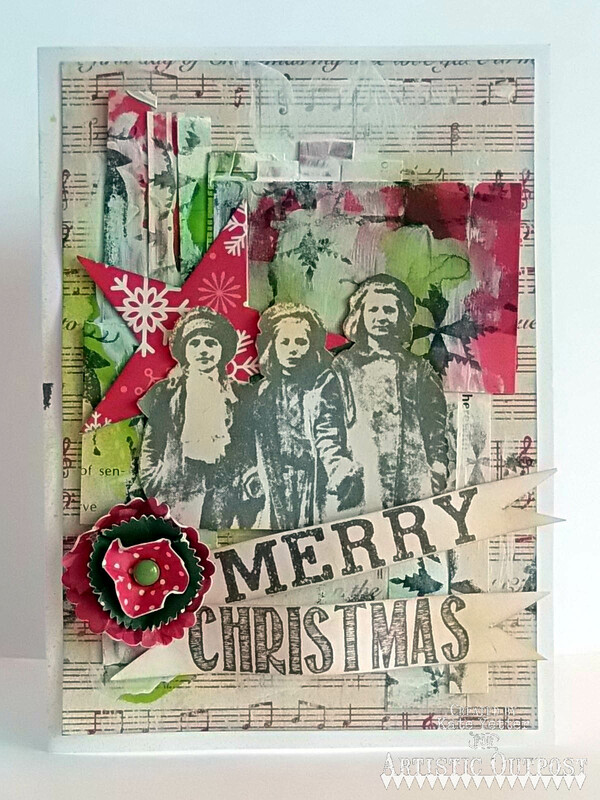 I made this card for Artistic Outpost using the new Toy Emporium Stamps. I love these stamps because they are so nostalgic and vintage in appearance. I hope you are enjoying the holidays with your family! Hello and welcome. Over at Artistic Outpost we recently had a new release. Today we are giving you some Fresh inspiration from the new release. 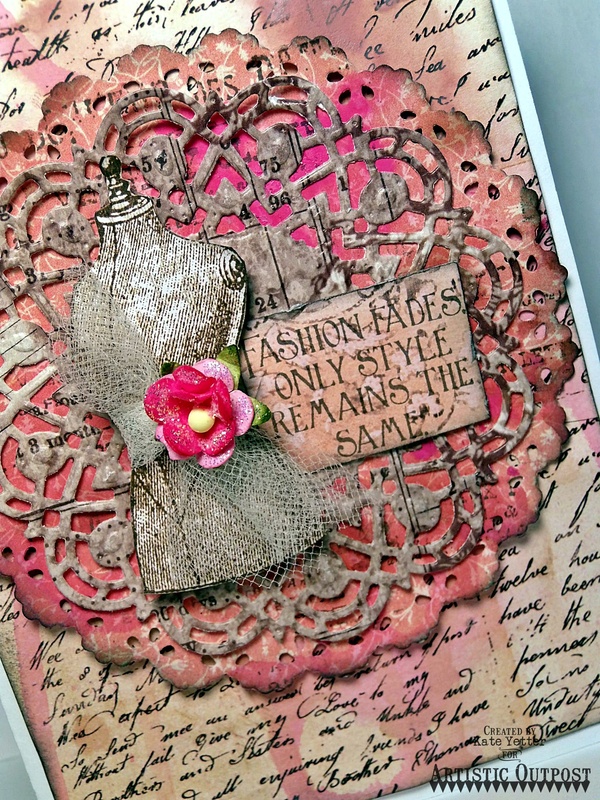 I am sharing a card from the Vintage Fashion stamp set. 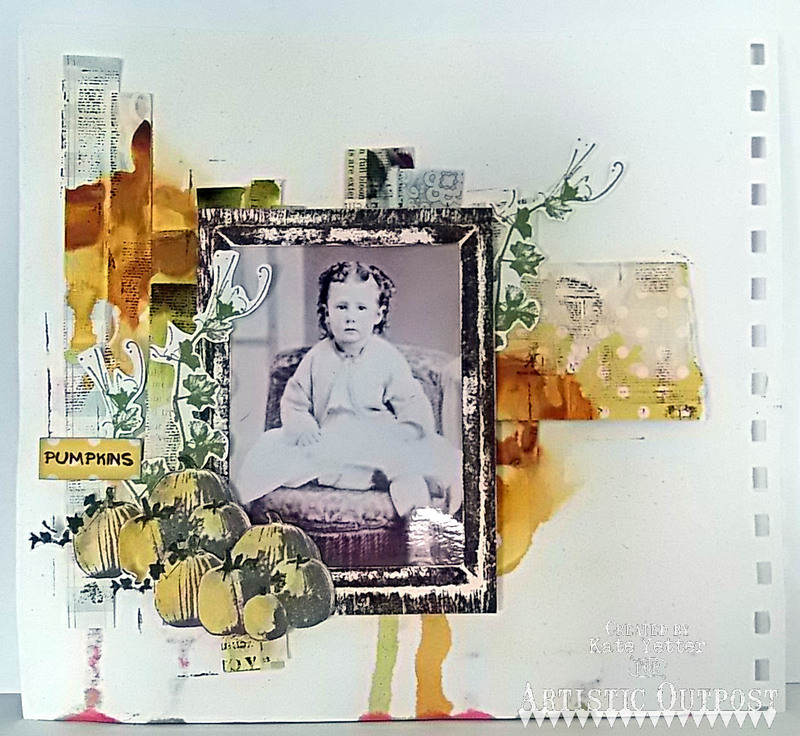 This Tri-Fold card was made using card stock and stained book paper. 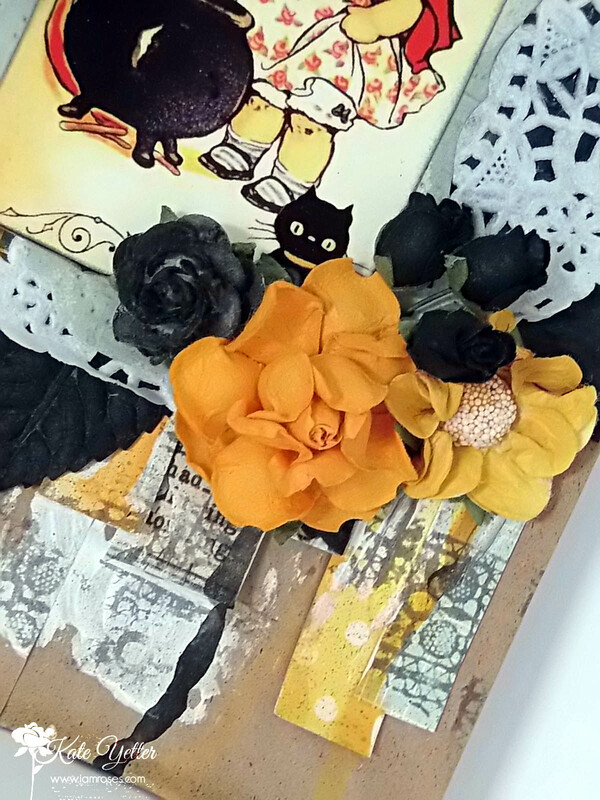 I used some chipboard stickers, gesso, paint and stamping for a lot of texture. 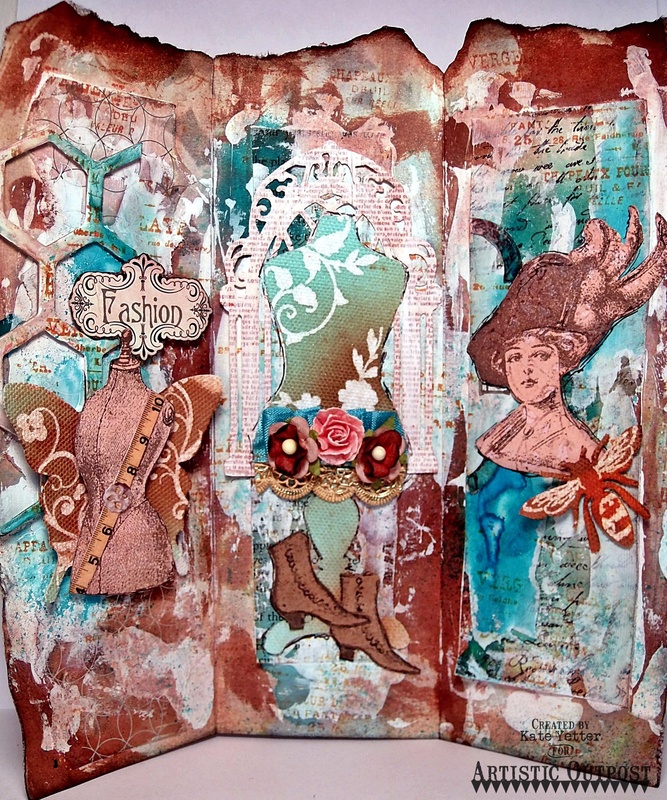 The focal images are stamped from the Vintage Fashion set and I used sprayed canvas die cuts, flowers and ephemera to embellish and lend to the theme. Don’t you just love this selection of stamps? Now, hop along to the other designers to see their fresh take on the new stamp sets. I am loving this new vintage Christmas set! Using the little girl and the sentiment, I made a tag pouch, but I am not sharing the tag just yet. My background was made using paints. I embossed the script in dark green. My embellishments include two doily dies, (this Doily is my favorite from ODBD) stickles, and a lot of white flowers. Another one of the amazing sets in this release. Who doesn’t love a beautiful dress form? My background is patterned paper with drippy paints. To embellish I added more die cuts. Can you tell I love those doilies? 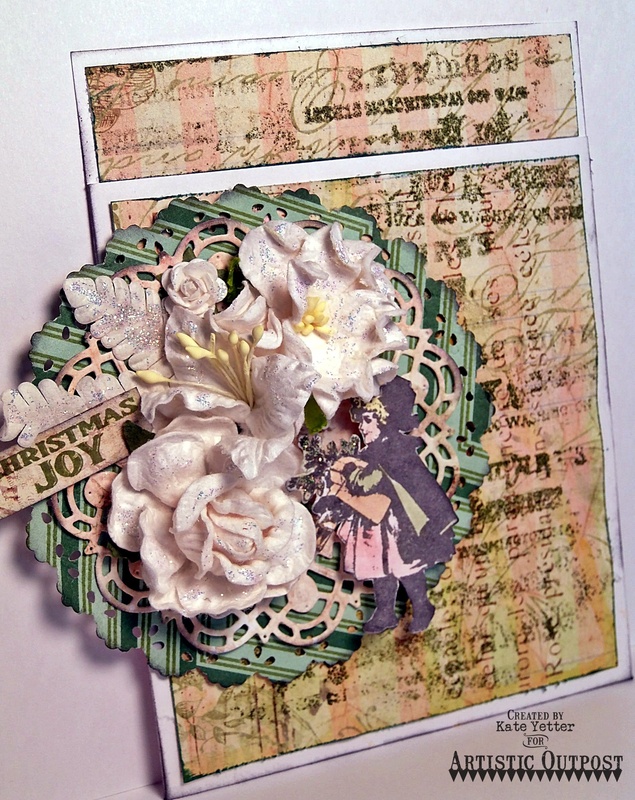 I used the Vintage Ephemera paper pad for the center doily. I kept the focus on that beautiful dress form embellished with some netting and a flower. Just for commenting on the Design Team Blog Posts, you have a chance to win a $15 Artistic Outpost Gift Certificate, good towards the purchase of AO Stamps. You have until October 9, 2015 at 10:00 PM CDT to leave comments on the participating designers blogs for a chance to win! Three random winners will be selected from the comments left on the designers blogs, the winners will be announced on the AO Blog on October 10, 2015, be sure to check back there to see if you have won! Now hop along to all the designers to see loads of inspiration. Don’t forget to comment for a chance to win! Also, you can also order Artistic Outpost products from the ODBD website, so you can save on shipping if ordering ODBD, NCC and AO products. I know…your wondering if I am still alive. It has been eventful as of late. Trying to sell a house in one state and trying to buy one in another has certainly been an eye opener to the incompetence of banks and lawyers. And then, pregnancy issues (sickness) on top of that. Did I mention that I am pregnant??!! So, that is why I have been MIA as of late. 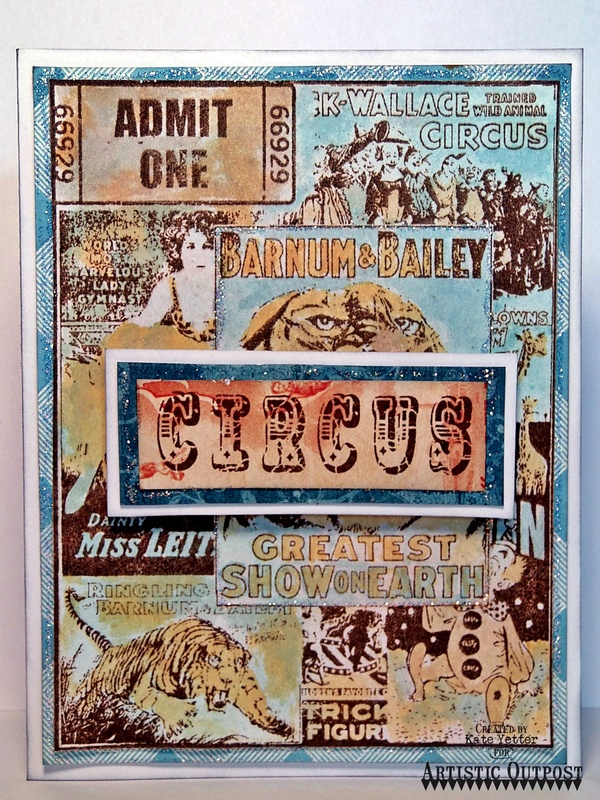 Just a few cards from Artistic Outpost ‘s Vintage Circus stamp set. Loving the retro look to this set! So many fun possiblities. And one more for fun! Hello. 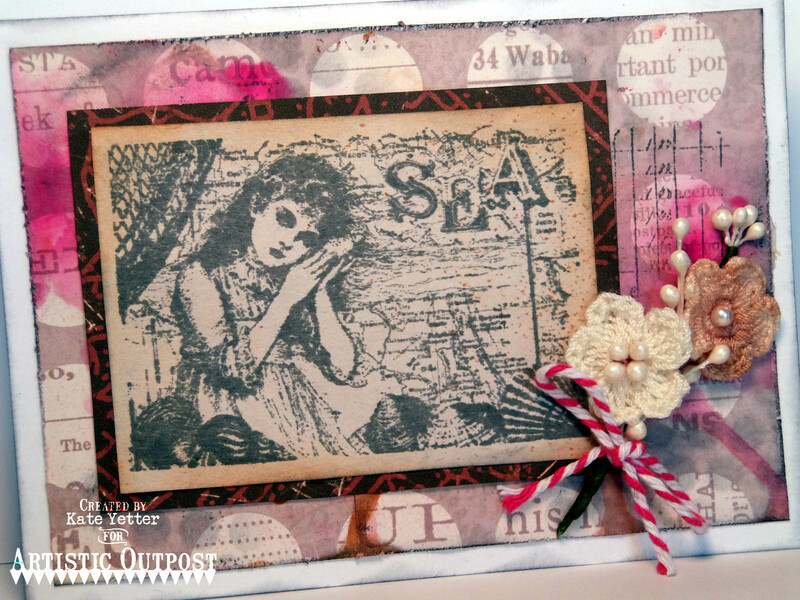 I have another card using the new Artistic Outpost stamp Sound of the Sea. 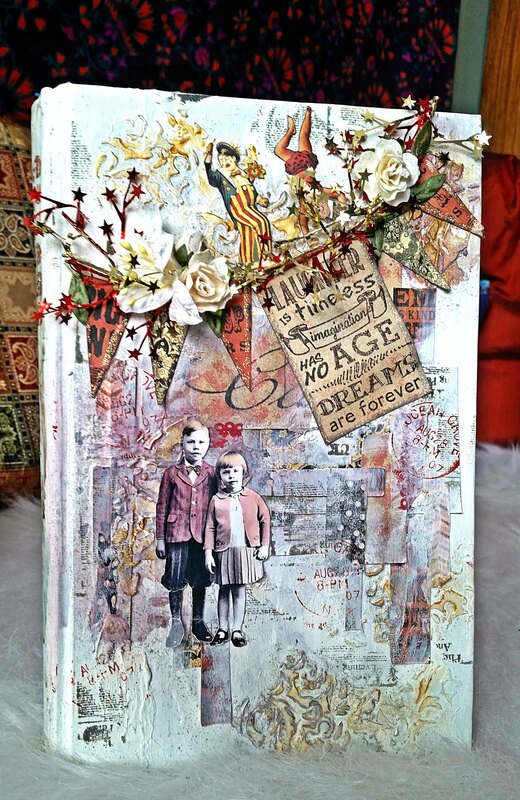 In the background I sprayed and used stamping from the Ephemera Backgrounds stamp set. I embellished with a few crochet flowers and twine. 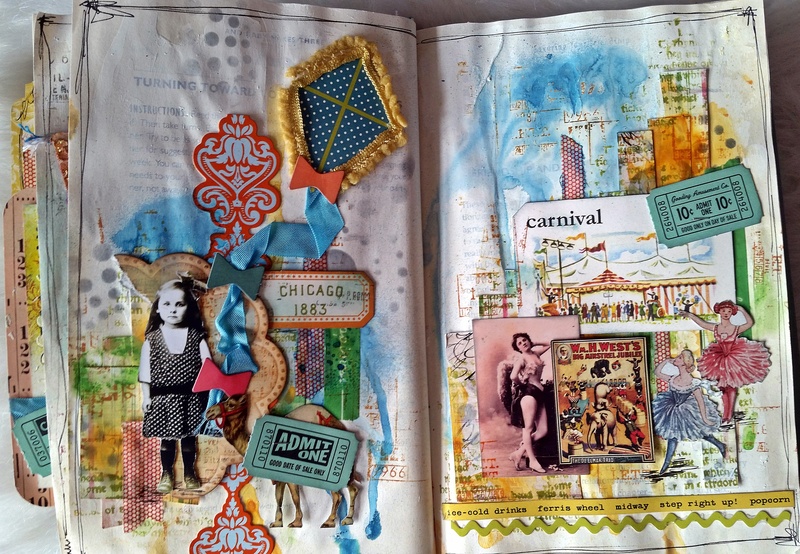 I made this journal page for Artistic Outpost using stamps from the Chalk It Up, Hayride and the London Underground stamp sets. 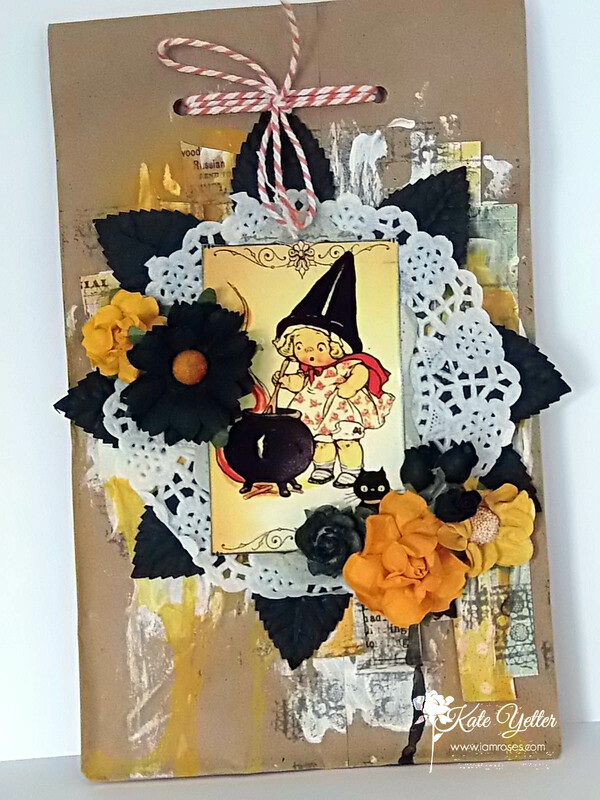 Today I am sharing a card I made for the Artistic Outpost blog hop. Our theme is Winter. I used the Christmas Chalkboard stamp set for the background and sentiment. The main image is from the Paper Boy set. Visit the Design Team members to get some Winter themed inspiration. 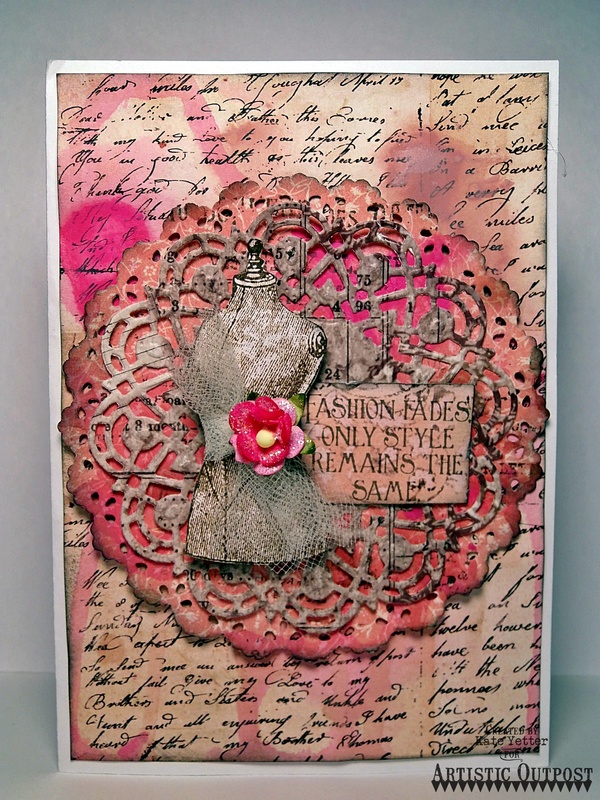 I made this card for Artistic Outpost using the Paper Boy stamp set and my fabulous new Vintage Flourish Die for the background. Hello! 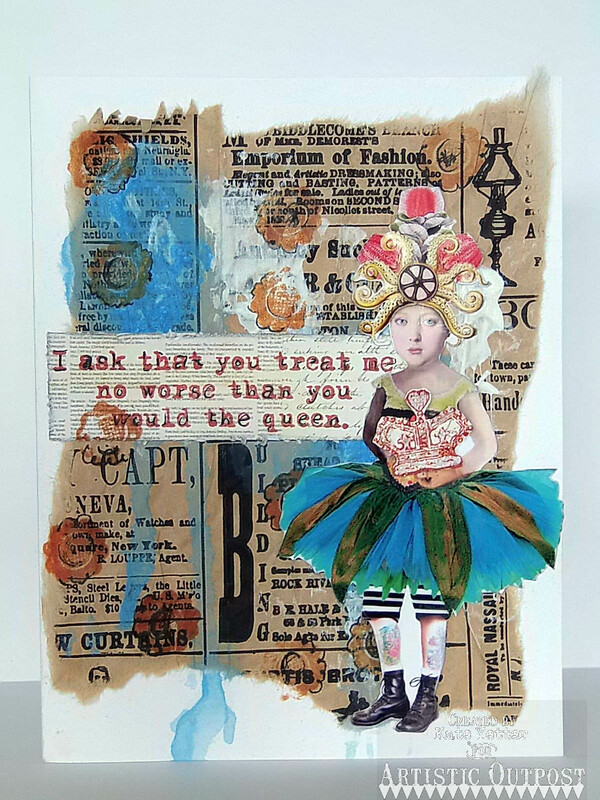 Today I am sharing a card for Artistic Outpost. The sentiment is from the London Underground and I used a flower for the background from the Serenity stamp set. The crown that the girl is holding came from the Wonderland Collage set.